Following there is a list containing the features of ChaosPro. It should give you a basic idea of how powerful ChaosPro is. 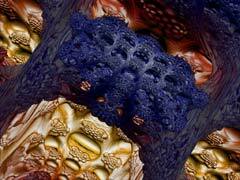 ChaosPro can create almost any kind of fractal using its integrated compiler. It is up to you which formula you want to use. So ChaosPro not only can create standard Julia and Mandelbrot sets, but also many other fractal types which are based on iterating a number. There are already thousands of formulas which have been written by other people and which you can use. 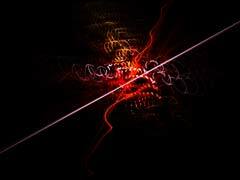 Among them there are formulas which create bifurcation diagrams, IFS fractals, Plasma fractals, Lindenmayer systems, dynamic systems like the Lorenz attractor, the Rossler attractor, and Lyapunov Spaces. Escapetime: A pixel in a window (2D point) is iterated and tested what "happens" to the pixel. The result is shown and colored accordingly. 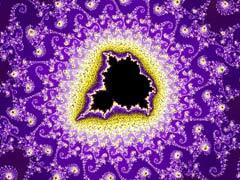 This kind of algorithm creates for example Julia and Mandelbrot sets, but it may also create any other fractal which is based on iterating a 2D pixel. 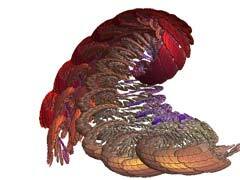 Attractor: An arbitrary 3D point is iterated again and again. After each iteration it is drawn. 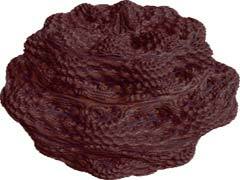 This produces 3D fractals which are rendered accordingly including light and shadow. 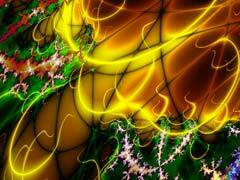 Examples for such fractals are IFS fractals, Flame fractals, and much more. 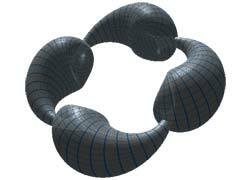 Quaternion: Similar to Escapetime, but uses Quaternion numbers and an algorithm similar to Escapetime which has been enhanced for 3D and 4D space. 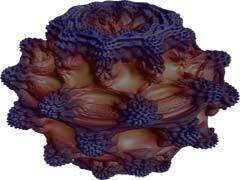 Examples for these fractals are Quaternions, but this type is perfectly suitable for rendering the Mandelbulb, too. ChaosPro runs on all Win32 versions, i.e. ChaosPro runs on Windows 98, NT, 2000, XP, Vista and Windows 7. If any other operating system supports Win32 (under Linux? ), then it's possible that ChaosPro runs there, too. 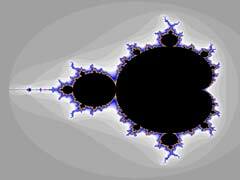 This means ChaosPro is a true MDI application where each fractal resides in its own window. 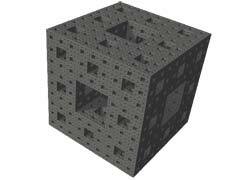 You can calculate several fractals at the same time in different windows. The different calculation threads use low priority, so you can calculate several fractals and continue doing your other work with the computer. All windows in ChaosPro are modeless dialogs, so can be open just as you like. You do not need to close any window in order to open another one. Well, to be honest, this does not mean that you can dive into the fractal in realtime (only if your computer is fast enough...). Realtime in ChaosPro means that all changes take effect immediately. 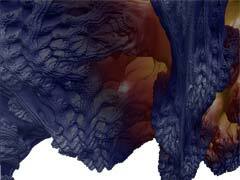 You grab the fractal with the mouse in order to move it around, and the effect is immediately visible. You assign another gradient (palette) and it gets applied immediately, no OK button to click on. 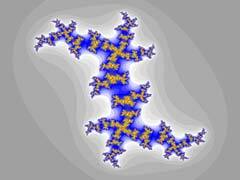 If you move a slider (perhaps the rotation angle slider) the fractal thread constantly gets noticed that the slider changed its value and adjusts the fractal. How good and how fast it catches up with the changes depends on how fast your computer is. If you resize the fractal window then the fractal gets scaled accordingly. ChaosPro does not use modal dialogs, all parameter windows are modeless. ChaosPro does not know that there are only a limited number of colors. Basically it thinks there is an unlimited range of colors. Later in the fractal calculation it determines the colors based on a gradient (well, in ChaosPro a palette is a path through the color space based on about 250 knots). 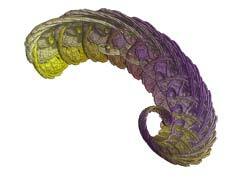 Depending on the coloring algorithm and on your display driver it then selects the colors. True color images with lots of colors, the mandelbrot set without those iteration bands, ChaosPro can calculate that sort of image. To be honest: ChaosPro is not 100% FractInt compatible: There are situations where ChaosPro behaves different from FractInt. But it can read almost 80% of FractInts fractal types, starting with julia, mandel, upto complexnewton, barnsley1m, IFS, LSystem, etc. ChaosPro's formula parser can parse FractInt *.frm files. ChaosPro's gradient (palette map) editor can read FractInt's *.map files. The IFS and LSystem formula editors can load FractInt's *.ifs and *.l files as well. A built in compiler which produces fast machine code. No extra DLL, no extra package to install. It's all in ChaosPro. For free. The compiler together with the import mechanisms allow ChaosPro to use all UltraFractal formulas (transformations, iteration formulas, colorings) and to calculate all fractals which UltraFractal can calculate. 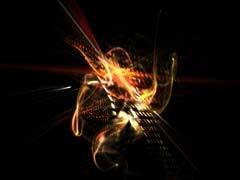 This especially means that ChaosPro has all the features of UltraFractal 3.02 currently built in. ChaosPro restricts you not only to simple zoom in/out/around movies, it lets you create animations based upon every fractal parameter in ChaosPro, in every combination. You simply define key frames of how your animation should look like, specify how many frames there should be between each pair of key frames and ChaosPro does the rest. The key frames may differ in any parameter which can be changed in a continuously manner, like the corners, the iteration value, the rotation angle, the parameter, the bailout value, the coloring paramaters, the palette and many others. Parameters which cannot change during an animation are the fractal type or flags for example: These must be the same during the animation. But the animation system is clever enough to not let you specify keyframes which do not match to the others you already have defined. So, are you interested in an animation flying into a Complex Newton Set, which keeps rotating, whereas the palette changes, just in order to fly around a bit and finally to fly back to the starting location animating the initialization point? Last update on Jan 02 2010.